Azerbaijan is marking Novruz Bayrami – the ancient holiday of Azerbaijanis with its unique traditions and popular entertainment going back millennia. Novruz differs from other holidays for its historical roots, essence and culture. Over the millennia, the Novruz holiday, with its ceremonies, customs and traditions, acts of kindness, oral folk tales, games and entertainments, has inspired poets, singers and performers, scientists and thinkers. Novruz which is celebrated on March 20-21 marks the first day of spring and the revival of nature or end of winter and the beginning of spring. Azerbaijanis and many other people throughout the world are happy to meet the warm spring and forget all about the gloom of winter. Each year more than 300 million people in Azerbaijan, Turkey, Kazakhstan, Kyrgyzstan, Turkmenistan, Uzbekistan, Tajikistan, Tatarstan, Bashkortostan, Xinjiang Uyghur region, the Balkans and the Middle East celebrate Novruz as the renewal of nature. Novruz is a family celebration, when the entire family draws together around a well-laden table of delicious national meals and sweets. However, the other days of the holiday are spent visiting friends and family, strolling around the city or the countryside. People try to meet the holiday with clean houses, believing that “a good beginning makes a good ending." So, many people are busy with tiding up their houses and yards on the eve of the Novruz. As many holidays, this holiday is also impossible without a festive table. It is the day when all family members get together to meet the new year with fun and joy. The required element of the festive table is khoncha, a big tray with semeni placed in the center, and candles and dyed eggs for each family member around it. Also "govurgha" (toasted wheat) is mixed with nuts (mainly walnuts, hazelnuts, almonds and chestnuts) and placed on the table along with other sweets. Such attributes of Novruz table as pakhlava (baklava), shakarbura (a cookie with nuts and sugar wrapped in dough), and shorgogal (layers of pastry flavoured with turmeric and fennel seeds) decorate almost all Azerbaijani tables. All these sweets are associated with star, half moon and sun, respectively, as their shapes remind these symbols. A "King" of Azerbaijani cuisine "Plov" (Pilaf) is an indispensable guest on every holiday table, along with other national dishes. With more than 60 different kinds, this dish gives the table a festive mood. 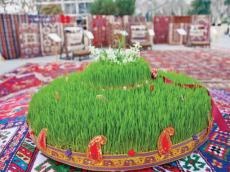 The growing of semeni - green sprouting wheat - is the most sacred Novruz ceremony as the herald of spring. Sprouting semeni symbolises sowing and a rich harvest, it represents grain, bread, increase and abundance. Grain and abundance is a pledge of life, existence, the most vital material necessity for life. People have always grown semeni from wheat, barley, peas, lentils or other grains in copper dishes; they have always revered it and rejoiced at its sprouting. On the night of the holiday, on March 20-21, you can join Azerbaijani children and roam the neighborhood knocking on doors and leaving hats hiding nearby to gather sweets. This tradition may remind Halloween trick or treating, and they are similar indeed. Lighting bonfires is another integral symbol of Novruz, almost each yard kindles its own bonfire, with people happily jumping over it for seven times. People of all ages will join in the tradition, happily believing that the fire will purify and take away all their troubles. “Relieve me of my troubles and misfortunes and bestow me much more joy" - they will say. Another interesting aspect of Novruz is its divination tradition. Mainly young unmarried girls will get together to know when they will get married or find out whether they will fulfill their dreams. Although people do not take this tradition seriously, they're still keen to keep the ancient ceremony alive, a link to the country's rich history. Symbolic characters of Novruz are Kechel, Kosa and Bahar gizi (Spring girl). All of them have their feature: Kechel characterizes the period before the renewal of nature, Kosa is a symbol of fertility, while Bahar gizi represents the landscaping of nature. On this day Azerbaijanis will not forget those less fortunate. They will make sure to send those with lesser means their holiday 'portion' or Novruz payi, so they can enjoy the sweetness of Novruz as well.